Freezer meals recipes are great time and money savers. With just a little planning you can have a freezer full of ready to cook dinners. Freezer meals recipes are all about preparation. Inexpensive foil pans and reusable, disposable plastic containers, and freezer bags will al come in handy. If you have a metal baking pan that you want to use you can but as much as I love Pyrex this is not the time to use your Pyrex. Pyrex will shatter if you take it from the freezer and place it directly into your oven. If you plan on using Pyrex for your freezer meals recipes bear in mind that you will have to thaw the food completely before baking it. Disposable foil pans, on the other hand, can go from freezer to oven without having to come to room temperature first. Disposable foil pans also keep clean up simple because you can just toss them out. Freezer bags are good for freezing precooked vegetables and can go straight from the freezer to the microwave. 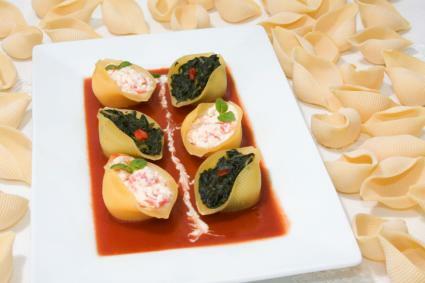 Manicotti or stuffed shells are two freezer meals recipes that are easy to make and fun to eat. Manicotti can be made with either pasta tubes or crepes. The choice is yours. You can make fresh crepes, or use frozen if you can find them at the store, or use pasta tubes which can be found in the dried pasta section of your local supermarket. While your picking up the tubes you might want to pick up some pasta shells as well. The only real difference between manicotti and stuffed shells, other than the crepes, is that manicotti is always filled with ricotta cheese but shells can be stuffed with just about anything you can think of. The usual alternative to ricotta cheese in shells is ground beef. This recipe fills 10 manicotti tubes or 15-20 pasta shells. You will need tomato sauce for these recipes. You can use your favorite jarred tomato sauce or make your own sauce. Mix together in a bowl the spinach, ricotta, Romano cheese, nutmeg and then taste for salt and pepper. Prepare the shells or manicotti according to the directions on the package. Spread a tin layer of sauce on the bottom of the pan. You can use a tablespoon to fill the shells; a piping bag will work best to fill the manicotti tubes. Fill each shell and place each shell or manicotti into the pan. Fill the pan with one layer of shells or manicotti. Wrap tightly with plastic wrap and place in your freezer. The day before you want to serve the shells place in the refrigerator to thaw. Remove the plastic wrap and foil. Bake the shells for 35-45 minutes. Pasta shells can also be filled with meat stuffing. This recipe will make 18-20 shells. Before you start to make the filling prepare the shells according to the packages directions. 1 large jar of sauce will be enough or you can make your own sauce. Place the beef and onion in a large pan over a medium heat. Stir the ingredients until the beef is just brown. Drain off the fat and let the beef cool. Put the cooled beef into a large bowl. Add the mozzarella, beaten egg, breadcrumbs, and garlic powder. Fill each pasta shell with the stuffing using a tablespoon. Spread a thin layer of sauce on the bottom of the baking dish. Fill each shell and place it in the baking dish, one layer of shells. Cover the shells with the tomato sauce. Cover with foil and then wrap in plastic wrap. When ready to use let thaw overnight in your refrigerator. Remove the wrapping from the baking dish.